Miguel Hidalgo y Costilla In September 1810, a plot to overthrow the Spanish Viceroy is revealed and the conspirators are warned to flee for their lives. Nevertheless, one of them, a priest named Miguel Hidalgo y Costilla decided to go ahead with his plan. 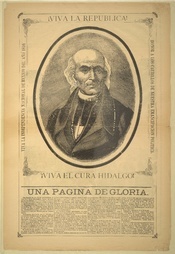 In the pre-dawn hours of September 16, 1810, he sounded the call for arms at his parish church in Dolores, Guanajuato: Hidalgo raised his hands for silence: "My friends and countrymen," he began. "The moment of our freedom has arrived. The hour of our liberty has struck," Hidalgo continued. The crowd grew silent as he spoke. "We have broken the shackles of tyranny. Neither king nor tributes exist for us any longer. We are a free people, but we have to fight for our liberty. Join me!" Hidalgo's voice roared out over the men. "We will fight for liberty and country." A chorus of "vivas" echoed back. WriteWork contributors. "Hero In Mexican History" WriteWork.com. WriteWork.com, 27 October, 2001. Web. 19 Apr. 2019.